I love Thai food, and we actually make our fair share of Curry, Tom Yum Soup and Pad Thai at home. Oddly though, we rarely eat at Thai restaurants. I’m not sure why that is. Like, in the case of Just Thai in Molito, we pass that place all the time but never really go inside. MrC or I would say, “Oh we should try this place one of these days.” And then when we’re out again, we opt to eat somewhere else. 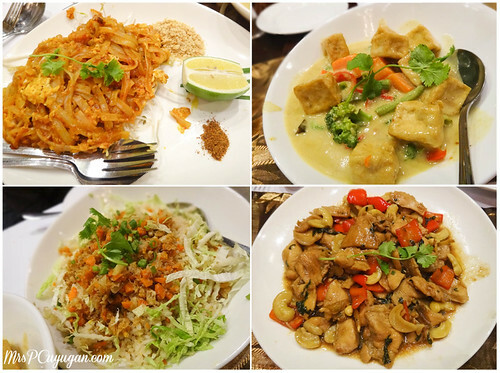 Last week, we finally got to find out what we were missing at Just Thai. I was invited by a fellow southie mommy blogger, Kathy Kenny, to join a small group of bloggers for dinner. I’m actually super happy that I was allowed to bring the boys with me, too. The three of us always eat out together, and the experience just wouldn’t be the same if they weren’t there. Little MrC and I got there at around 6pm, and we waited for MrC to join us, as he was on his way home from work. I got to chat a bit with Kenny and a couple other bloggers I met at the Chicdriven launch I attended at Azumi Hotel a few weeks back. The restaurant was nice enough to feed my little boy ahead after he so loudly declared that he was super hungry, then proceeded to down a plate of peanuts and a mango shake. 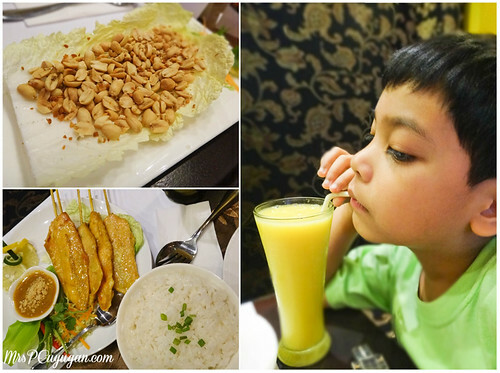 The kiddo was served a plate of Chicken Sate and a bowl of Pandan Rice. Super good, and super kid-friendly. I often worry about what to feed this kid when we dine at Asian and Indian restaurants coz some flavors and spices just don’t agree with a child’s taste buds. I’m happy to report that, at Just Thai, this will not be a problem at all. While waiting for everyone to arrive, we were served cold drinks. Of course, I chose my super forever favorite, Thai Iced Tea. I love how thick and creamy Just Thai’s version is. I would seriously go back just for this. 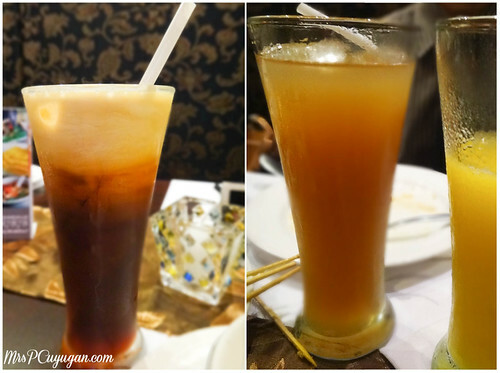 MrC tried the Tamarind Juice, and he said it tasted like those sticky tamarind snacks that he likes. After a while, our group was complete. I was so excited to finally have a face to match one of my favorite Twitter friends, @SouthSnippets, and also to finally attend a blogger event with my real-life friend Joei. And then, it was time for dinner. We started with two big bowls of soup and a salad. The Tom Yum soup was quite nice, tangy and spicy and really MrC’s type. 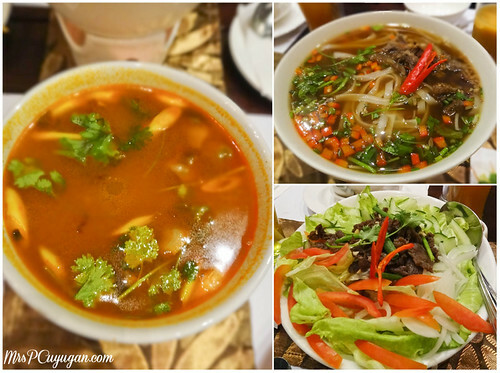 The Kuai Tiao Neua, was a beef noodle soup with a hint of sourness. It was good, but I can’t eat a lot of it. I loved the Yam Neua, a salad topped with spicy-sweet beef that went so well with the fresh veggies. The main dishes were all really good, too. I love that we got to try so many of them, and believe me, there was a lot to sample. 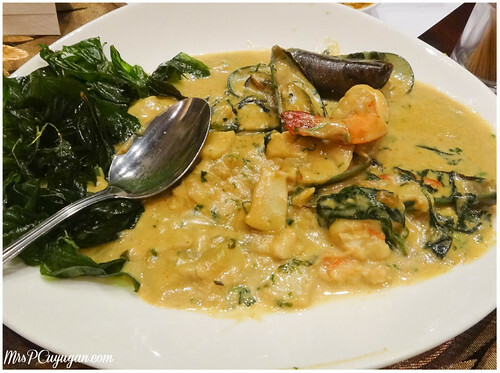 My favorite was the Pad Gaprow Talay, which is a mixed seafood with basil dish swimming in a coconut-cream sauce, kind of like a curry. The basil really gave this dish a clean, fresh taste. We also got to try the Pad Thai, which is a must-order for me at every Thai place. Just Thai’s was different because there was a hint of tomato in there. This is the first time I’ve had Pad Thai like this, and I order this dish a lot. I even make it at home. I enjoyed it though, and I like that it’s not the usual. Also served to us were the Gai Pad Met Ma Maling, which is chicken with cashew, the Gaeng Leuang, a yellow curry dish with vegetables and tofu, and Crabmeat Fried Rice. I was glad that the kiddo had some plain steamed rice left over, coz the main dishes were so flavorful that they really needed plain rice. I imagine the crabmeat fried rice would be good with Pandan Chicken, which is something I have on my must-try list for our next visit to Just Thai. We were all super full (and the boys were actually sleepy) after all that food. There was no way we were leaving without trying the desserts though. We all loved the Tha Kho coconut pudding, which was really light and not very sweet. It was a great ending to a meal that was so full of flavor. I also had a bite of the Khao Niaow Ma Muang, which we all felt was too pretty to eat. 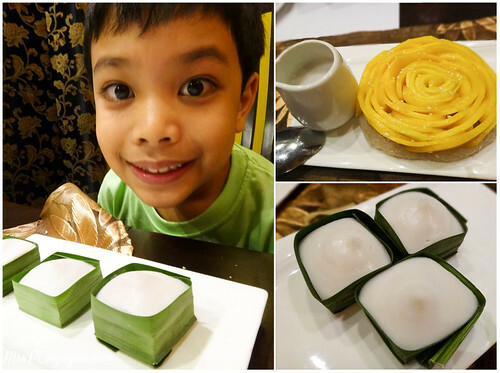 It’s a super heavy dessert made of sticky rice topped with mango with a coconut sauce on the side. I prefer it without the sauce, though. I think this would actually be great as an afternoon snack. We officially have another restaurant to add to our must-visit places in Molito. Thanks so much, Just Thai, for a wonderful evening. The boys and I super enjoyed, and we certainly went home stuffed and happy. We will be back soon! 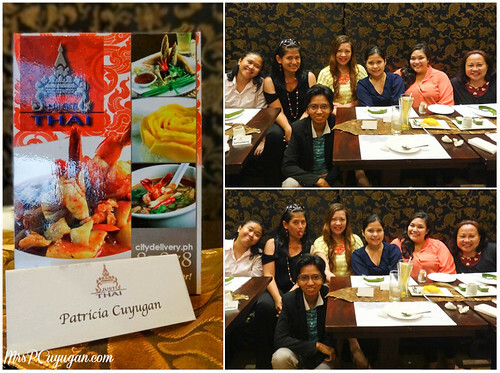 With my blogger dinner dates! One Sunday, while the little boy was at Fishville with his grandparents, MrC and I decided to go out for dinner after mass. We decided to try out Con Gusto in Molito. It was an easy reastaurant choice, for once. They had me at Buon Giorno. If you ask me, I’d rather still drive to Tagaytay to eat at Buon Giorno, if only for the whole road trip experience and ambiance. At the same time, the menu at Con Gusto doesn’t have everything that Buon Giorno has, which is actually something I’d expected. What I didn’t anticipate though was that the prices seemed a bit steeper, and the servings were smaller. But anyway, I can’t really complain because it really is more convenient to come and eat here, since Molito is only 5 minutes away from home. So here’s what we had. Disclaimer: I can’t actually remember what each of these dishes are called, since this dinner happened a few weeks ago. Sorry!!! Our family had lunch at Ramen Yushoken in Molito last weekend, and I forgot to bring a camera. Winner. Good think I had the spare, super low-end Android phone in my bag, the phone I use for Instagram. It has a much better camera than my high-tech BlackBerry. So yes,we had lunch at a Japanese restaurant on Chinese New Year. Ramen Yushoken is said to be the best ramen place in the south, and Our Awesome Planet’s Anton Diaz agrees! We had to wait a while for a table, but we didn’t actually mind. While waiting, we took a glance at their menu, which was short and sweet – just ramen, a few side dishes and drinks. At the bottom of the paper menu, it states that they don’t pack food to go and that they don’t have any forks at the restaurant. 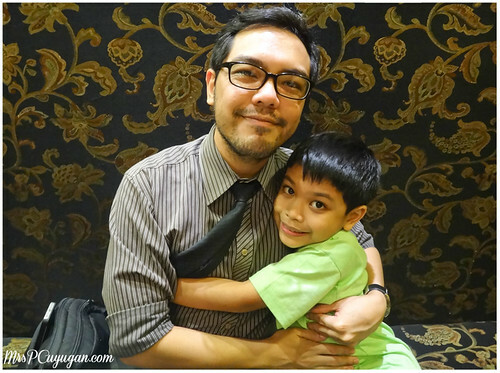 Mommies and daddies, take note of this! You might want to pack a set of utensils for your kiddos. It was quite an experience for us trying to feed the little guy with chopsticks and a soup spoon.